A Proton-M rocket, which blasted off from Baikonur on Tuesday carrying three Glonass-M satellites, crashed immediately after takeoff due to an emergency shutdown of its engines. According to Deputy Prime Minister Dmitry Rogozin, the accident will result in “extremely harsh” measures and spell the end of the space industry as we know it. 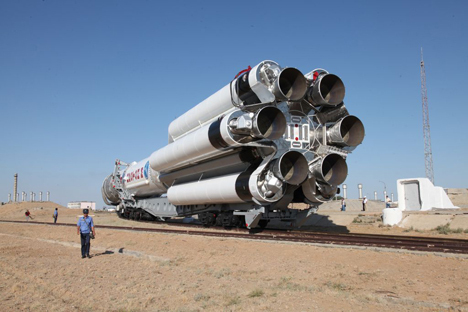 The recent crash of a Proton-M rocket has triggered a slew of official statements on the urgent need to reform Russia’s rocket and space industry. Preliminary causes of the accident have already been announced. According to Deputy Prime Minister Dmitry Rogozin, the accident will result in “extremely harsh” measures and spell the end of the industry as we know it. Deputy Prime Minister Dmitry Rogozin has promised that extremely harsh measures will follow an investigation into the causes of the failed Proton-M launch. A Proton-M rocket, with a DM-03 booster that was carrying three Russian-made, Glonass-M, space-navigation satellites, crashed less than a minute after being launched from Baikonur on Tuesday morning. On Tuesday, June 2, Prime Minister Dmitry Medvedev ordered Rogozin to form a government commission to look into the causes of the crash. “The current status of the rocket and space industry is unacceptable for further movement forward,” Rogozin was quoted by RIA Novosti as saying. Rogozin noted that the president had mandated establishment of a special commission to draft the industry’s reform. A standardized technical policy will be implemented to narrow the product range and, thus, cut accident rates. “An industry reform is long overdue: It hasn’t just become urgent today, after this crash,” Alexander Zheleznyakov, a member of the Russian Academy of Cosmonautics, told Vzglyad newspaper. “There are several ways to proceed with the reform,” said Zheleznyakov. According to Deputy Prime Minister Rogozin, telemetry results are expected by the evening of Wednesday, June 3, after which the causes of the crash might be established. However, key preliminary versions have already been offered. A RIA Novosti source within the rocket and space industry speculated that issues with the engine or the control system might have caused the crash. “It’s either the engine or the control system. If the accident happened between 10 and 20 seconds into the flight, the engine is most likely to blame,” the source told the news agency. According to another source, the human factor played a role. “This is a fairly simple and very well-known machine. The rocket was not the reason: It was people, and the cause is clearly production-related,” the source said. Manufacture and launch of the Proton-M rocket and the three Glonass-M satellites cost approximately 4.4 billion rubles ($132.3 million). The crash will have an impact on the Glonass implementation schedule. “Of course, this accident will put a brake on the Glonass federal program, because four more satellites were supposed to be launched into orbit by the end of 2013. The three we lost today, plus one more scheduled launch … Our satellite formation is now fully deployed and ensures stable signal reception virtually anywhere in the world, but a certain reserve capacity is always needed for normal operations,” a rocket and space industry expert said. The expert added that the three lost satellites would need to be replaced, but the new ones will be launched in a year’s time at the earliest. One of the consequences of the Proton crash is that launches from Baikonur scheduled for the next three months will be delayed. According to specialists, Proton launches will be suspended, pending the results of the investigation into the causes of the crash and implementation of the commission’s recommendations on how to improve the rocket’s reliability. The next scheduled launch was to take place on July 21. Now, the crash might also delay the launch of a multi-function lab module to the International Space Station, which is scheduled for the end of this year. Based on materials from Rossiyskaya Gazeta and Vzglyad.